Šri Kãmãkshi in the black stone sanctum. She is another form of Šri Pãrvati. Here we see Her peaceful demeanor, standing on one foot and meditating at the center of a circle of fire. Her meditative state illustrates Her absolute control over Her senses, inspiring and blessing us to adopt that higher goal in life. Other than worshipping the divine with and without forms, a third way of representing the divine is in a symbolic object such as the yantra (a geometrical representation of the different roles and energies of a Deity on a thin metal sheet), the Mahã Meru, etc. Mahã Meru is a three-dimensional yantra placed in front of Šri Kãmãkshi. This Šri yantra brings out all roles of Šri, the Divine Mother, such as prosperity, beauty and divine knowledge. 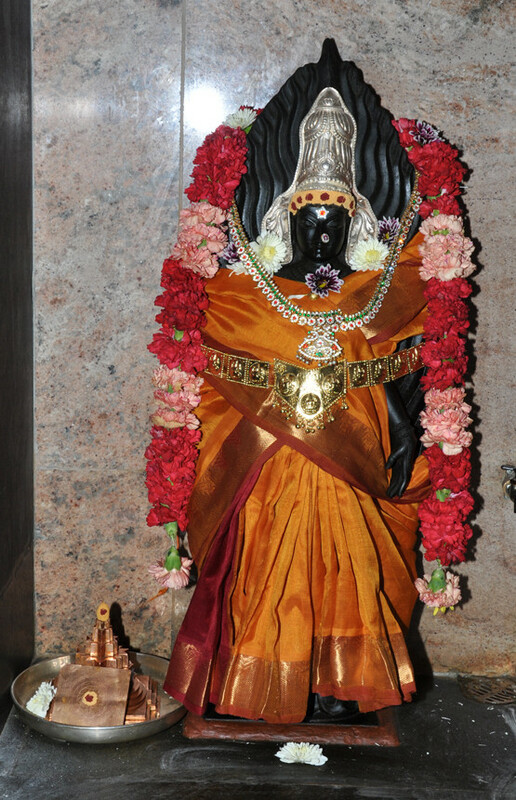 The presiding Deity represented by Mahã Meru is Šri Kãmãkshi. Šri Kãmãkshi (utsavar) & Šri Ankušam – Astradevas : in another wall enclosure is utsava moorthy of Šri Kãmãkshi along with the Ankušam – a weapon held by Šri Ganeša, Šri Šiva, and Šri Pãrvati, which is glorified as a Deity. Ankušam is taken around the perimeter of the Temple during the Ganeša Chaturthi celebrations in symbolic supervision of the offerings made to Šri Brahma and the presiding Deities of the eight directions to derive favorable results.